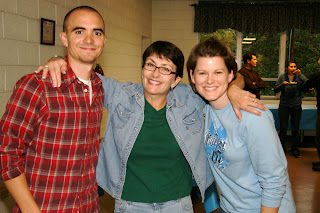 On Sunday we all went to Asheville for one last time. Dinner at the Noodle Shop and then decadence at The French Broad Chocolate Lounge. I have always wanted to try sipping chocolate- doesn't it just sound like what rich people would drink? Clay and I both tried the cayenne and cinnamon kind. Wow. So good. We enjoyed just sitting around with the group and talking. We will miss these people and their precious kids!! Our plans, you ask? Well, after we finish up tomorrow we will be packing and cleaning machines! We will leave for Texas as soon as everything is done- either Monday afternoon or Tuesday morning. Keith will be here tonight and tomorrow so we look forward to seeing him, possibly for the last time on this side of the ocean for awhile. Thanksgiving is in Breckenridge, Tx with my (Megan's) family so we will head straight there. We are looking forward to relaxing with the fam. Boy could we use some relaxing! A happy Thanksgiving to you all! I hope your weeks are full of thankfulness! Just a quick heads up on how you can be praying for us. Today our visa applications and passports arrive in New York for processing for our two-year stay in Belgium. We've heard it takes about 2 months to process this, so please pray that this process goes FAST - even faster than the norm! We can't buy our tickets until our visas come in (otherwise we miht have to pay to bump them back to wait on the visas), so the sooner they come in, not only the sooner we can leave, but the sooner we can prepare to leave. We'd really like to get to Belgium before February because of a few things happening on that side of the ocean but of course, we're trusting the Lord's timing of all this. If they don't come in until later, so be it. We certainly have our preference, but if the Lord has other plans, we'll take it. May the Lord's face shine upon you today. As it says in Psalm 96, Give to the Lord the glory he deserves! Our special friends Rich and Michelle went back to Cali today :( It feels so strange to come back to CIT and not be their neighbors. We will miss them!!! The day itself was wonderful, however. We took off for Charlotte, and en route to the airport, we stopped at Price's Chicken Coop which has been rated the nation's #3 top fried chicken place. This was too tempting to pass up. Michelle and Rich have been talking about this since we met them so it was fun to actually go. Michelle cannot contain her excitement upon ordering. My fried chicken meal for 2008. Clay will miss hanging out with Rich. It makes it better knowing that we will see them next year when they get to France! We really will miss you two. And how does a girl cope when her friends leave? Happy Saturday to you. And thank you Jesus for good friends! So truly gorgeous. Here is Clay and his hatchett, which he used to chop fire wood. He was absolutely giddy the man was so happy. Watching the sun set from a nearby cliff. It was just so peaceful and quiet. I really needed that. Me making Clay laugh, my most accomplished skill. Ok, so the best part of the night, and the main carrot Clay dangled in front of me to get me to come, was watching MacGyver on the side of a mountain!!! Clay and I have been going through the seasons of the show for the last couple of years, and this was the perfect time to watch an episode. You can't really tell from the picture, but we were sitting on the cliff overlooking the scene in the first picture (at the top). So we were nice and high, could see the stars and some city lights. We had a fire, a la Clay the woodsman, and we had MacGyver. The mere memory is enough to make me smile. I was so happy. The night turned cold quickly, and we were looking forward to our sleeping bags, guaranteed for weather down to -5 degrees. By midnight we were both awake and SO cold! Clay had suggested taking off my socks so the sleeping bag could make the best use of my body heat. Let me tell you, I must have looked like a runaway worm wriggling all over the tent trying to get my socks back on without unzipping my sleeping bag. It was a beautiful, peaceful morning. I have been meaning to update these last photos from the Sandozes' visit. Maybe you remember this photo from an earlier post? We headed back to this same location, and wouldn't you know, behind those clouds was an incredible view!! We have so enjoyed these months in beautiful North Carolina. The colors of fall here are amazing. This is one of my favorites because you can tell how happy they all are. We truly had a great trip. Can I just say that half day Thursdays followed by a three day weekend is God's gift to CIT students. Whew. We are having a great weekend, so relaxing. We went camping on Thursday night and had a blast. Pictures to come!! 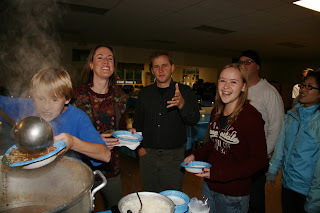 Last Friday night the Sandozes made gumbo for the entire CIT group! 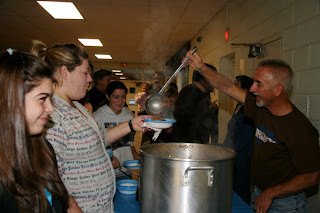 So many people had never even heard of gumbo so it was fun to be the ones to expose them to the cajun way. Phil stayed the front of the line to help serve and give tips- how much rice? do you want your potato salad in the gumbo or on the side? (such decisions!). Here is the Mackey family. Bob is our advisor and leader of our Heart of the Missionary group. We have enjoyed getting to know their family. They were in Moscow for about 10 years and have great insight and lots of stories!